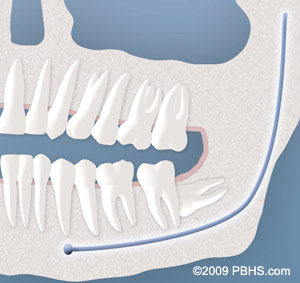 Wisdom tooth extraction is one of the most common dental procedures. At Bellflower Oral Facial Surgery & Dental Implant Center, we have the extensive experience and state-of-the-art tools to make this procedure as quick and painless as possible. If you need your wisdom teeth extracted, whether they are impacted or not, don’t hesitate to schedule a consultation with us. Also known as third molars, wisdom teeth are the rearmost teeth in all four quadrants of the mouth. They are the last teeth to erupt from the gums, usually in the teens or early twenties. They gained the name “wisdom” because they appear later in life when one presumably has more wisdom than as a child. Most people have four wisdom teeth, but some have less or none at all. The amount of wisdom teeth you have can be determined by an X-ray. An average adult has 32 permanent teeth. However, the human jaw is often too small to accommodate the additional wisdom teeth. There is not enough space for the teeth to erupt, so they are considered impacted. Impacted teeth eventually lead to health problems. They are difficult or impossible to clean, leading to cavities and infections, and they crowd out the rest of the teeth, pushing them out of alignment. During your visit, we will take an x-ray to assess the condition of your wisdom teeth: if they are impacted, how much room there is for eruption, and the best method for removal. The best option is to remove your wisdom teeth before they become impacted. In soft tissue impaction, the wisdom tooth erupts, but not enough space exists to allow the gums to retract, which is necessary to clean the tooth properly. In partial bony impaction, there is not enough room for the wisdom teeth to fully erupt. The partially erupted teeth make it difficult to chew, and since they cannot be accessed for cleaning, they have a high risk of developing infections. 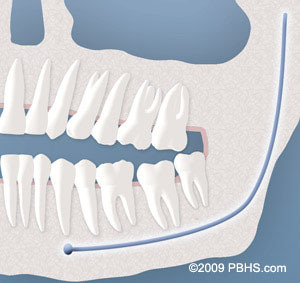 In complete bony impaction, the tooth has no space to erupt, so it remains embedded in the jaw bone. This type of impaction is the most difficult to address, since the tooth will need to be surgically removed, and it may be in an abnormal position. Prevent problems with impacted wisdom teeth by addressing them early in life. Even as an adult, if your wisdom teeth are causing problems, there are many options for addressing them. Call Bellflower Oral Facial Surgery & Dental Implant Center, and let us give you the comfortable, personalized care that you deserve. Dr Hooman and his team were phenomenal in providing excellent service, care, and quality. The staff and Dr Hooman were also very professional and friendly. I had a wonderful experience and will most definitely recommend Dr Hooman and his team to a friend. Overall, I would highly recommend this practice and everyone that helped was kind and welcoming. Thank you.